« Rule of Thirds: Be sure to BREAK this photography rule AFTER you learn it! 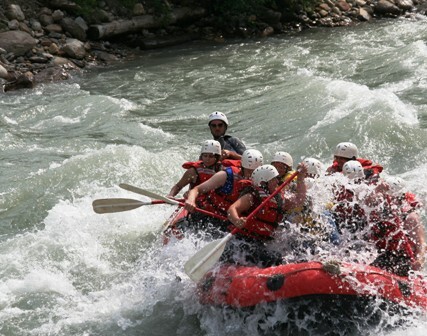 Whitewater Rafting: Water Torture or Death by Extreme Fun? The wall of icy water hit me so hard that I sat unable to take my next breath – for over a minute – I’m sure of it. 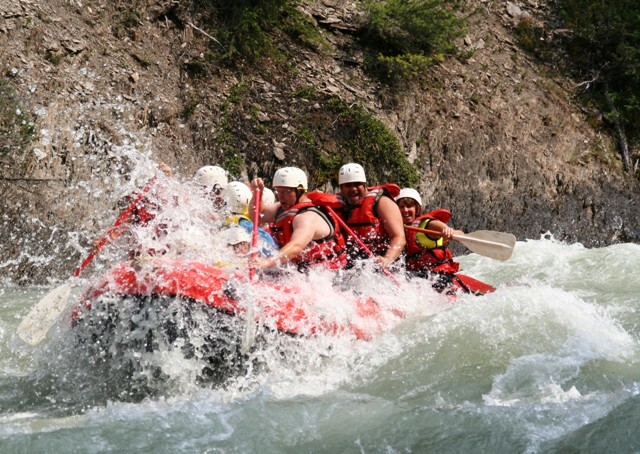 I am also sure our whitewater rafting guide had it in for me. I could see it in his eyes, from the moment he handed me that ridiculously small wetsuit. I mean, who in their right mind expects any self-respecting woman to don one of those things; it outlines your fat, for heavens’ sakes. But wear it I did, and what’s more I got back at our nasty guide. I should have suspected something as soon as I saw those wetsuits. Our three grandchildren slipped into theirs like eager seals, while my husband and I grimaced. We grumbled, accepted our Lilliputian-sized wetsuits, and headed into our respective change rooms. You see, my husband and I are a little overweight, well, okay, a little more than a little overweight. The idea of squeezing our bodies into the wetsuits was as idiotic as trying to put toothpaste back into its tube. Not gonna happen. But it did, and we did – we put those suits on. And, miraculously, we zipped them up, too. My next clue was the life jacket – or rather the way our guide snugged me into it. Was there an evil gleam of delight in his eyes as he corseted me into my vest? “It’s too tight,” I squeaked. “It’s okay,” he said. “It’ll loosen up in the water,” he added, as he handed me my helmet. In the water? IN the water? I thought I was going to be ON a raft. Things went from bad to awful as we made our way down the path towards the rafts. I could see trouble coming – the rafts weren’t neatly secured to a solid dock; they were bobbing about near the shore. The guide actually expected me to sally up and launch myself into a forward seat. This act did not make for a pretty picture. I heard “Ooohs,” and “Oh-boys,” and “Watch-its,” and “Yikes,” as I sprawled myself across the middle seats, having nearly pitched myself into the river. I crawled forward and sat precariously, not IN the raft, but on ITS EDGE! What kind of tomfoolery was this? I hoped this company gave refunds. The grandkids piled in, as did the rest of the guests, my husband included. His boarding did not make for a pretty picture either, but finally we were loaded. It was about two-thirds of the way into our trip that it happened. I believe our guide called the hollow in the water something like the, “Devil’s Eye” or maybe it was the “Devil’s Revenge.” I should have known something was afoot when our guide, the man I had come to trust, and who had seemed quite reasonable for the past half hour, told us to paddle towards the shore, towards that hole in the water, that very deep hole between the waves. The wave hit me so fiercely and with such vehemence, I stopped paddling. It was all I could do to clutch the security rope, and my paddle, and try to catch my breath. The water was colder than hell; well, if hell was cold. I saw my life flash before my eyes. My instincts were right – our guide did have it in for me. When I came back to reality, I heard laughter, screeching laughter. Was it my own? (Yup, that’s me.) The icy water had turned me into a crazy person; I was laughing with the rest of the fools on board. But that guide was not getting away with this; I knew just what to do. I showed up the next day. The pamphlet had advertised “Great Fun.” And I was certainly in the market. It was going to take a lot more than a little bit of icy mountain water to stop me from taking this ride again. All kidding aside . 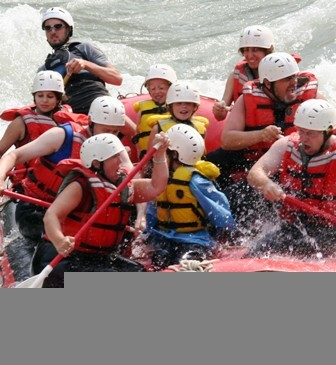 . .
We booked through the Columbia Rafting Adventures company located in Fairmont Hot Springs, British Columbia. 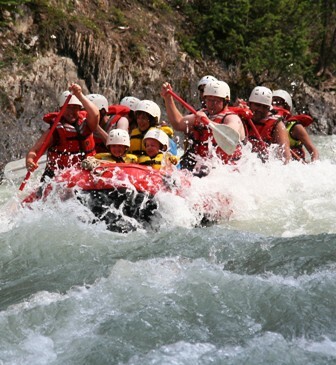 We chose the milder Toby Creek White Water trip but tougher rapids are available on the Kicking Horse River where the company offers its “Ultimate Whitewater” trip. All ages are welcome, even kids as young as 5-years-old. And nothing could be safer. The guides are terrific, and they make safety their #1 priority. They work hard to keep all guests happy and relatively dry. All, that is, except for crazy old grey-haired grandmas who think riding the wild rapids is for them, too. This entry was posted on Saturday, March 15th, 2008 at 12:52 pm and is filed under Adventure Travel, Canada, Family Vacations, Tourist attractions. You can follow any responses to this entry through the RSS 2.0 feed. Responses are currently closed, but you can trackback from your own site. yeah, canada is pretty sweet. Thanks for your comment. Glad you enjoy Canada, too.